Slab City, Calif., is a desert oasis in a down economy. There is no running water, no electricity, and no sidewalks. There are no buildings, unless you count the outhouses. Structures are either RVs or trailers, or a combination of scraped parts from the two. Building codes don’t apply here. For all it lacks in amenities, Slab City – about two and a half hours east of San Diego — has a lot to offer: two libraries, two churches, several social clubs, a night club, a skate park, a pet cemetery, a golf course, hot springs, and kitchens providing free meals. Local churches and charities regularly deliver bags of food and clothing. There is enough folk art to fill two metropolitan museums. Slab City, sign, just a hint of the folk art you’ll find. And it’s all free. Yes, free. 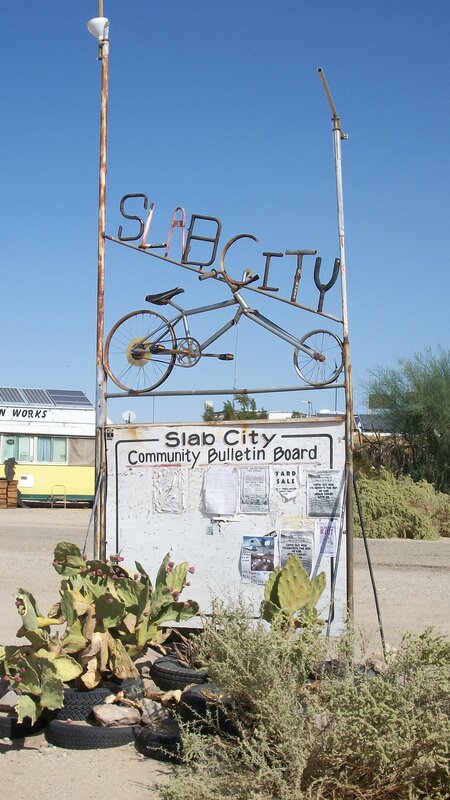 Slab City has an estimated 150 year-round residents. From November to April approximately 3,000 snowbirding RVers arrive to camp for the winter in the warm southern California desert. In a place such as this, I wanted to know how people feel about the state of the economy. “Tennessee Ken” Freeland, 69, lives in his converted van in Slab City six months a year. The other six he lives in, well, Tennessee. Also in his van. With a fixed income of only $789 per month, he has gladly accepted the free food from the local charities for the past three years. “Until gas prices drop to a reasonable rate, the economy isn’t going to straighten out. Then people would travel more, and food prices would drop,” Ken says. He used to live in an RV, but at only eight miles per gallon, it was too expensive to drive. His van gets 15 miles to the gallon. Rich, 69, and Mary, 67, Baughman, are from northern California. They live in Slab City, their “second home,” about five months during the winter. When they arrived in their 40-foot 2005 Phaeton Class A motorhome, the property value of our little campground went up significantly. Rick Webber, 54, lives in Slab City about six months a year. He is the minister/director of The Haven, one of the two churches and a favorite hangout for those who prefer to get away from the drugs and alcohol that sometimes run freely in Slab City. He’s noticed an increase in the need for spiritual services, as well as the size of his congregation. The Haven provides free meals twice a week. “More people are turning to the ministry because they are going through hard times,” Rick said. “Hiker Mike” Brown, 42, is from Washington. After seeing it in “Into the Wild,” he decided to use his temporary layoff from work to check out Slab City. Hiking in from Venice Beach, Calif., he intended to stay for a week, but has been here for three, and plans to stay another six. An intelligent young man still in his earning years, Mike had trouble finding even part-time work in southern California. Everyone was quick to point out they have another reason for returning every year: To see the friends they’ve made here. Get the eBook! “To RV or Not To RV, that is the question.” Everything you ever wanted to know about a home on wheels, but were afraid to ask. Pingback:Slab City is, umm, different. Very different.